This party canopy is ideal for your next major outdoor event. 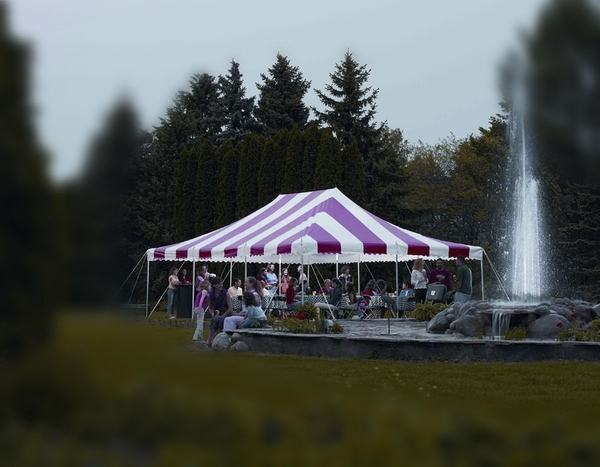 The breathtaking 20' x 20' pole tent features a beautiful, one-piece, 11 oz. translucent top that can resist both fire and mildew. The top is available in white, or white with vertical colored stripes. The party canopy covers approximately 400 square feet of space, and can be installed by only two people. The canopy features attached guy ropes and D fittings. The canopy also boasts anodized sectional aluminum center poles and 7' side poles for added strength, and there are storm lines positioned at each of the center poles. The corners and pole positions are reinforced for added durability.The set includes all of the needed poles, stakes and storage bags.